A partner to Comic Relief, Sport Relief is a biennial fundraising event that encourages the British public to get active. This year, Sport Relief takes place over a whole week rather than just one day, between Saturday 17th March and Friday 23rd March, culminating in a live TV show on BBC One on 23rd March. It’s a very fitting time to hold the event – just as this year’s PyeongChang Paralympic Winter Games close on 18th March, and in the same year as the FIFA World Cup. Celebrities including Zoe Ball, Jonnie Peacock, Greg James are getting involved this year, taking part in a series of challenges to help raise vital funds for those in need in the UK and overseas. How to take part in Sport Relief? It’s not too late to start fundraising for this year’s Sport Relief! Whether you want to take part in a sporting event or do your bit by purchasing official Sport Relief merchandise, there are lots of ways to get involved and raise funds. A collective challenge to beat a billion steps a day is taking place on the lead up to the show on 23rd March. You can get involved by downloading the free Sport Relief app here. Make sure your steps count towards their goal! Including trackers, celebrity challenges, and workplace leagues, the app is also suitable for wheelchair users. Celebrity fitness coach, Joe Wicks, and Davina McCall are going head to head in a step battle, using the free Sport Relief app to build support. Who are you backing? 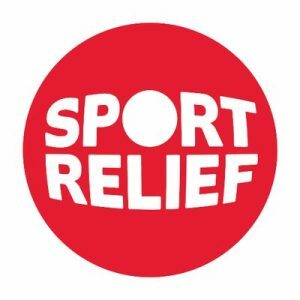 Sport Relief also have a host of fundraising tools available on their website here, including packs, sponsorship forms, online giving pages and much more. So, if you want to do your bit, do check out their tips, tools and posters and do something fun for charity! Another way to get involved is to order your Sport Relief merchandise, with proceeds going to charity. From fab deeley boppers to wristbands and pin badges, check out Sainsbury’s range of merchandise here. Children of all ages can get involved: With the aim of improving health and wellbeing in schools around the country, school children and youth groups can take part. Primary school age children can organise sponsored miles, skip-a-thons or a school disco. Older children can organise daily challenges, perhaps pitting students against teachers at school in running competitions and more. Schools can order their free fundraising packs here. 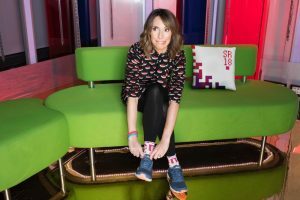 The Mother of all Challenges: Alex Jones, presenter on The One Show, is doing her bit for Sport Relief this year by taking part in five days of gruelling challenges across the UK. Along with four inspirational mums, Alex is taking on tough tasks in Loch Ness, the Lake District and the Brecon Beacons to raise awareness of important issues around maternal health. You can follow Alex and her team’s progress by watching The One Show. The money raised for Sport Relief is fundamental in tackling issues affecting people in the UK and across the world. This year, the money raised will be helping to improve the tools and resources in ending malaria, improve the lives of mothers and babies around the world to prevent maternal deaths, and raise awareness of good mental health. Read more about how Sport Relief has helped millions of people around the world. Sport Relief is the perfect opportunity to bring communities and get active for a good cause. We are thrilled that these activities can be inclusive too by encouraging mass participation, as the official app converts steps for wheelchair users. Also, Sport Relief is known to raise money for disabled sports clubs across the country, such as the Ipswich Sports Club for the Disabled. So, do your bit for Sport Relief this year and get involved with the fundraising efforts. Help make a difference to the lives of disadvantaged people in the UK and across the world.